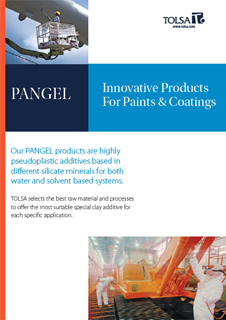 PANGEL® S9 by Tolsa is a mineral rheological additive for aqueous systems. Imparts excellent thixotropic and pseudoplastic properties. At rest, it provides the system with a high consistency, which produces a suspending effect and a great resistance to settling, avoiding sedimentation. Under a shear stress, it forces the viscosity to promptly fall down, easing manual and mechanical spreading and levelling. It keeps a high absorption capacity and a high degree of interaction with polymers. 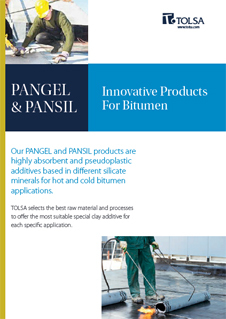 PANGEL® S9 is used in sound dampening systems with the purpose of creating a perfect control of the rheology at high temperatures used during the application and final set of particular bitumen system. Suitable for use in water-based paints and foundry coatings. Recommended dosage is 0.05-2%. It has a shelf life of 2 years.